If you are an entrepreneur, business owner or salesperson, and you’re tired of chasing prospects and playing the numbers game…I have some great news. 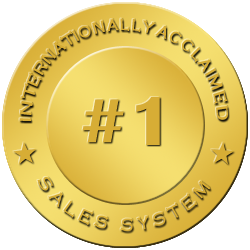 Today Is The Day To Make Your Sales Breakthrough! 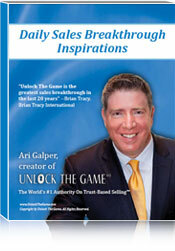 Unlock The Game® is a new sales mindset that frees you from unnatural selling scripts. Instead, you’ll learn how to begin new conversations with prospects, naturally — no pitching, no persuading and no pushing. In just a few minutes, you could be on your way to making your sales breakthrough so you don’t have to subject yourself to painful chasing of prospects anymore. I’m going to show you in detail how to get started using my proven, simple to implement trust-based sales strategies that will help you sell with trust without having to ever again compromise your integrity. As you read and absorb our trust-based Unlock The Game Mindset, you’ll find your own sales mindset will expand, you’ll start to think in a different way, you’ll discover how to surpass your wildest expectations and chuckle as you watch your potential clients open up to you in a way you have never experienced before. The “Fast Start Pack” is perfect if you want to get started right away implementing the core “actionable” Unlock The Game sales strategies. Within minutes, you’ll start making the shift from the frustrating old-style selling approaches to a more natural and trust-based way of connecting with your prospects over the phone. Not only will you receive everything above in the “Sales Breakthrough Fast Start Pack”, but you’ll also get access to the following life-changing bonus audio seminars valued at over $394. 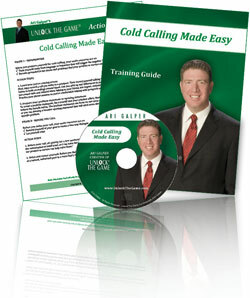 Don’t Make Another Sales Call Until You Listen To This Powerful Bonus Audio Seminar! 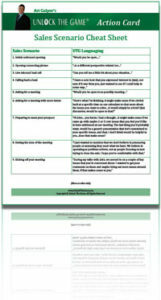 This Daily Sales Breakthrough Inspirations Guide will keep you on track with the Mindset every day. It gives you a 365 daily sales breakthrough inspirational insights and thought-provoking questions to keep you focused on making the Unlock The Game Mindset a daily habit. Just the simple act of taking a few minutes each day to absorb and think about the trust-based thinking insights in this breakthrough guide will make the Mindset a natural habit for you. There are no printed dates, so each year you can print it out and start fresh again. 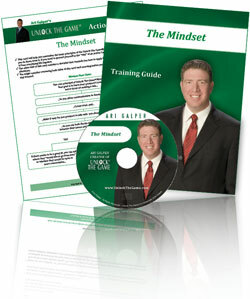 (Shipped As Hard Copies CD’s and Printed Training Materials. – Brian Tracy is a leading authority on personal and business success. 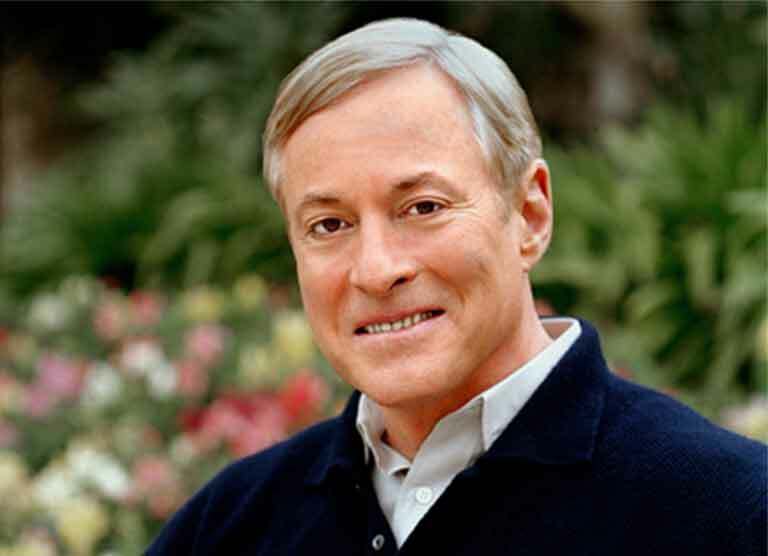 As Chairman and CEO of Brian Tracy International, he is the best-selling author of 17 books and over 300 audio and video learning programs. How long has Unlock The Game been available and how many people are using it? How is Unlock The Game different from all the other sales programs on the market today? It doesn’t compare at any level. It’s completely different because it addresses the hidden psychological roadblocks that hold you back from unlocking your true sales potential. It gives you an easy-to-use new trust-based sales mindset backed by trust-based words and phrases that create real genuine trust with your potential clients. You’ll experience an instant sales breakthrough the moment you begin implementing any of the trust-based sales strategies found in “Sales Breakthrough Fast Start Pack”. How do I know that Unlock The Game doesn’t just contain the same old “sales messages” that I’ve heard so many times over the years? Unlock The Game overturns the very definition of what selling is all about. It directly challenges every traditional sales tactic you’ve been exposed to by the traditional “sales gurus” (you know who they are!). Will Unlock The Game give me immediate results, or is it a program that I have to study or memorize? With the “Sales Breakthrough Fast Start Pack”, you never memorize anything. Unlock The Game helps you draw upon your natural skills in human communication to create spontaneous, positive conversations with prospects that develop into trusting business relationships based on your ability to solve their problems. The moment you listen to the audios, read the “Sales Breakthrough Guide Book”, you’ll begin to experience new breakthroughs that will help you experience instant results. Does “Sales Breakthrough Fast Start Pack” work with Voicemail and Gatekeepers? Oh yes, very much so, but not in the way you might think. The sales “gurus” have trained us to try to get “past” gatekeepers, but that creates an inherent conflict because, as you probably know, it’s a gatekeeper’s job to block you. 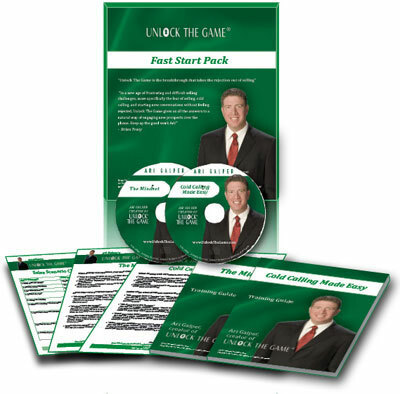 With the “Sales Breakthrough Fast Start Pack” you’ll be given immediate trust-based relationship-building strategies to connect with gatekeepers as people who are willing to help you get to where you need to go. And wait till you hear about new ways of handling voicemail…you’ll find all of this in the BONUS AUDIO “Trust-Based Gatekeeper and Voicemail Selling Strategies”. Is the “Sales Breakthrough Fast Start Pack” available in download? No, it is only available as hard copy CD’s and print. After I order, how long does it take to receive the “Sales Breakthrough Fast Pack”? Within the USA, it will arrive within 5-7 days, outside USA, it will arrive within 7-14 days. Here are some ways you can have Ari personally take your sales success to the next level. If you’re the kind of person who is absolutely committed, without hesitation, to making investing in yourself and your business a top priority and you want to be personally mentored by the World’s #1 Authority On Trust-Based Selling, then this is your chance to spend an entire day with Ari one-on-one. An application is required to be considered for a Private VIP Mentorship Day held in sunny Sydney, Australia. In a single day, you will experience the once-in-a lifetime sales and business breakthroughs that you have been searching for. Many of Ari’s private client’s have flown in from all over the world to spend a day with him and they have all taken with them the exact breakthrough tools, strategies and plans to finally reach their personal and professional financial goals. Inquire for rates and availability by contacting our office here. How many speakers have you heard who were truly memorable? What was special about them? You remember their message resonated with you so much that it changed your life and you’ll never forget it. 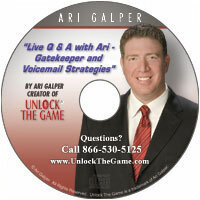 Unlock The Game founder Ari Galper’s fresh, original, and inspiring talks and workshops create instant results and inspires them to rethink how they are selling from a trustbased selling point-of-view. If you’d like to have Ari speak to your group, contact our office here for more details. If you’d like Ari to personally come into your company and train and transform your sales team and culture to one of frictionless sales results based on creating deep trust with your prospects, then contact our offices here for more details.